If you're after an affordable compact camera with usable viewfinder and considerable zoom in a pocketable package then there's nothing better than the Lumix TZ80. The addition of touch controls finally brings it into the modern age - although the lack of a tilt/vari-angle screen is a shame. The Panasonic TZ range is hugely popular when it comes to dedicated compact cameras, especially if you're looking for big zoom in a relatively small package. In 2016 the range is diversifying: 2015's TZ70 is replaced by the similar TZ80 (or SZ60 for our American friends), as reviewed here, but there's also the new, larger-sensor TZ100 (SZ100) joining the line-up - see our other preview for that model. 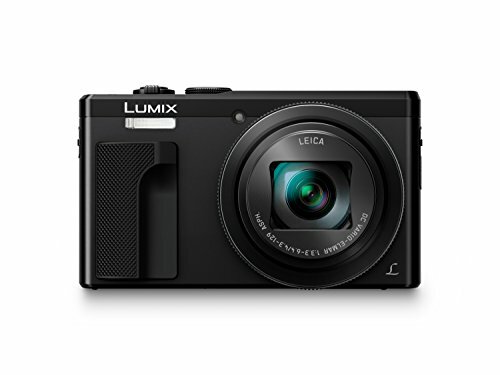 With a 30x optical zoom, the Lumix TZ80 is the do-it-all pocketable compact camera, adding touchscreen controls (see, you can touch this) and a higher-resolution sensor to the equation for the 2016 re-lick. But is that enough to warrant its presence in the smartphone camera era? We've been using the TZ80 for a long weekend to see if its zoom really sells it or not. The TZ80 is a familiar compact, its biggest external addition compared to the TZ70 being a more prominent grip to the front. Otherwise it's very much business as usual: a rotational control ring around the lens, rotational d-pad to the rear, mode dial up top, and a bunch of quick controls to the rear. READ: Panasonic Lumix TZ80 vs TZ70: What's the difference? It's not overwhelmed with must-use controls, though, as the TZ80 is very much a point-and-shoot camera that can also be used with full manual controls, to allow you to develop over time as you need. It is, of course, a lot chunkier than that other camera more than likely already in your pocket though - namely your smartphone. Joining the TZ80's built-in electronic viewfinder - which is the same 1,166k-dot panel of last year's TZ70 model - the thing that really changes the camera's functionality is the touchscreen. It's something we thought the TZ70 sorely missed and makes using the TZ80 just that much quicker. Sure, we've hit the screen by accident and moved the focus point somewhere we didn't want it from time to time - but that happens with our Lumix GH4 too, and is easily rectified with another tap to reposition. No biggie. The only thing that's really missing in the screen department is the ability to manipulate its position. We've become so accustomed to cameras with tilt/vari-angle screens and how much they aid waist-level shooting that we're almost surprised such a feature is absent in the TZ80. Saying that, it'd add yet more bulk - although we suspect that could be negated if the lens was condensed and refined in its zoom ability. Because it's the lens that is the TZ80's biggest success and biggest downfall all in the same breath. It's the very same 30x optical zoom optic as found in the earlier TZ70, delivering a 24-720mm equivalent focal range, meaning you can fit lots into the frame at the widest-angle 24mm setting or capture far-away subjects as if they were nearer to the camera when zoomed all the way in. Seemingly it can do it all. However, it can't do it all, because as the zoom extends the amount of light that can enter the lens diminishes, which can make dim and low-light situations taxing or near impossible to shoot. That's what the f/3.3-6.4 part scribed on the front of the lens barrel means: at the 24mm equivalent the widest aperture is f/3.3 (which isn't especially bright anyway), which then dips to f/6.4 (which, to clarify, is a smaller opening, despite its larger number) at the 720mm equivalent. It's the usual wintry mix of sunshine, showers and dull clouds in the UK at the time of writing. So, as with so many things, the TZ80 responds as a tale of two halves: it's super fast and absolutely on-point for those long zoom shots in the middle of the day. But as the sun dips, those early evenings have often caused us difficulties when shooting because the numbers just don't add up and, as a result, it's all too easy to have results blur. The camera does warn with a red "shaky camera" symbol on the screen, though, but as it's happy to offer 1/15th second shutter speeds with full zoom extension even without the ISO sensitivity maxed out (to ISO 3200) it's certainly, um, optimistic in its thinking. There is, however, decent built-in optical image stabilisation - but that can only go so far. So balance your expectations because the TZ80 isn't really a pro night owl. But while low-light might prove tricky to get a steady hand-held shot, it doesn't cause many issues with the TZ80's rather accomplished autofocus system. If there's limited light available then the live preview on screen will drop frame-rate and stutter somewhat, and autofocus is far slower, but the camera is still adept at locking on and confirming focus. We've stuck with the 1-area autofocus option for the majority of this test, as the ability to reposition it across the screen via touch and quickly resize it (only when active) using the rear rotational d-pad makes it easy to use. It's really quick in bright light too, almost instant. There is also a 49-area auto mode which decides the subject and area of interest for you - which you may or may not want as the focal point. Face detection and Tracking options also exist, and work fine enough, although the Tracking mode isn't especially speedy at keeping up with moving subjects (single/continuous autofocus is actually a separate option, but tracking will always work on a continuous AF principle). Close-up focus needs to be manually engaged (when in a manual shooting mode) by hitting the left d-pad direction and toggling between standard AF and AF Macro, the latter allowing for 0.03cm close-up focus at the 24mm equivalent. That drops to 2-metres when extended to the 720mm equivalent, though. If the camera is in an auto mode it will automate between those standard/macro options for you. It's 2016 and 4K ultra-high definition is all the rage. Which, if you're unfamiliar is the next step beyond "Full HD" (1920 x 1080) to UHD (3840 x 2160). And the TZ80 can cater for that by shooting 4K video (25/30fps at 100Mbps), which is certainly worth a cheer. But Panasonic is keen to sell 4K as more than just a video option. The TZ80 is the first Lumix compact camera to adopt 4K Photo and Post Focus options - both of which are available on many of the Lumix interchangeable lens G-series cameras - in an attempt to further standout from the crowd. The 4K Photo shooting modes - now available via a quick access function button to the rear - allow for a rapid burst of shots (extracted from a movie file, essentially), the best of which can be selected as an individual 8-megapixel frame after shooting. It's even possible to shoot a single second's worth of footage before even firing the shutter to help catch that perfect moment. Still, we're just not sure about the description of the mode, plus - and while the 4K "stacked" symbol is marked on the camera's rear Fn1 button - we're unconvinced its on-camera visuals implicate exactly what the mode does. It's a learning curve, perhaps, that will cement itself into consumers' minds over time. The newer Post Focus mode - which does what it says on the tin by allowing you to focus the shot after taking it - has a similarly prominent/confusing position on the camera's Fn2 button. If you're hoping to shoot hand-held like you would with a Lytro using this mode, however, then you'll be disappointed: the Panasonic needs a tripod for steadying the frame while it grabs a movie file at multiple focal depths. It's possible to play back the 49 collective Post Focus files per shot, which highlight in red or green to verify an in- or out-of-focus subject respectively. There's some application to this mode, perhaps, but it's more fun than being a must-buy lure for this camera. And if you're mounting on a tripod to shoot then you ought to be adept enough to critically focus in the first place. As we had said of 2015's TZ70, the TZ80's built-in Wi-Fi does a decent job of sharing files direct from camera. After downloading the Panasonic Imaging App it's quick and easy to sync with a smartphone (there's no NFC this time though, not than anyone ever used it), where it's then possible to preview a live image, remote control the camera, playback images, and now share directly to a variety of social media and other sources. Two generations ago it wasn't possible to easily share to social media, with Panasonic forcing a Lumix Club sign-in - but that's no longer the case. You want to share direct to Twitter? You got it. It's all good. However, there's still no GPS (global position satellite), which had featured in the TZ60 and some previous Lumix models. Not a major problem, as a smartphone can sync that, but your images won't be marked with geographical data direct in camera. That will help battery life last out that bit longer, though, and stops the price creeping any higher. It's been a bit of a yo-yo rollercoaster when it comes to resolution in the TZ-series. The TZ70 dropped the resolution compared to the TZ60, but the TZ80 goes yet higher, squeezing 18.1-megapixels onto its 1/2.3in sensor. We queried why this was the case and Panasonic's response is that it's difficult to get lower pixel counts with the latest technology. The company's development teams aren't dedicating resources to such an idea when the end consumer is always looking for higher resolutions - even if that didn't really impact the 12-megapixel TZ70's sales, which has been a storming success in multiple territories. So how does the TZ80 fare? Rather well, all things considered. Whereas many smartphone cameras exhibit smeary processing and pixilated gradients (such as in skies), the TZ80 keeps things looking smart. It's even possible to shoot raw files (although you'll need compatible software to edit them - Photoshop will be on board, it's just a case of waiting for an update which is unlikely to be available at launch) for deeper editing in post-production. However, related to what we were saying earlier about limited light entering the camera due to the lens configuration, it's all too common for high ISO sensitivities to be selected. An ISO setting is, in essence, how much the camera needs to amplify the given signal to achieve an exposure - the more a given signal is "pushed" the less sharp and more "noisy" it can become, sometimes revealed as coloured flecks throughout a shot. In the case of the TZ80, even at ISO 1600 - which is commonly used when the zoom is extended - the results are pretty good. In a shot of fallen autumn leaves the detail is ample, only revealing lack of critical sharpness when viewed at 100 per cent scale. But image noise is minimal, certainly a long way beyond what a smartphone could achieve - not that such a device could zoom to a 720mm equivalent anyway. Colour noise isn't entirely absent though. In a well exposed near-black-and-white shot of our Naim Mu-so speaker in the dark - the TZ80 handled that lighting arrangement well - some flecks of greens and purples can be seen, but they're not to the total detriment of the image. Move down the scale and even a backlit doorway at ISO 160 shows some subtle colour noise in the mid-greys of the walls to the sides of the shot, if you're really looking for it. Overall, though, we'd say the TZ80's full ISO 80-3200 range is quite usable. And with the 4K mode meaning 8-megapixel stills can be extracted from video in-camera, there are a variety of ways to shoot. If you're going to be using the zoom to the maximum, however, then do keep in mind its limits - especially in low light. While the TZ80 is perfectly capable at producing decent images for a camera of this type, and is relatively untouched by the near competition (only really Canon makes anything close), it does have its limits. If you're after an affordable compact camera with usable viewfinder and considerable zoom in a pocketable package then there's nothing better than the Lumix TZ80. The addition of touch controls finally bring it into the modern age - although the lack of a tilt/vari-angle screen is a shame. That said the TZ80 does try a bit too hard. Its limited aperture lens sees the camera quickly find its limits when extending the zoom and/or shooting in low light. It'll surpass a smartphone camera in terms of quality, for sure, but don't necessarily think of it as the miracle solution to all your photography needs. The compact camera market is in a position of change, with more attention being focused on higher-end and more capable models (such as the 1-inch sensor TZ100 mentioned at the beginning of this review). But that doesn't see the TZ80 entirely down and out; this is a compact that still offers oodles of value - it can shoot 4K video as one prime example - and clearly shows its years of experience. Once again, it's hard to ignore this Lumix for all the things it does so well.